Fresh off his first ever museum show, Jeff Soto is now hard at work on his inaugural UK solo show “The Inland Empire” at Stolenspace, set to open May 14th. The show will feature about twenty new paintings as well as some installations centering on themes of economic recession that most of the world is going through and in particular where Jeff grew up and currently lives at – the Inland Empire.Â Expect more coverage here as the show draws nearer but for now, take a look at this photo that Jeff sent us from his new body of work. Categories: Art, Contemporary Art, Low Brow & Pop Surrealism, Shows & Events, Teasers. 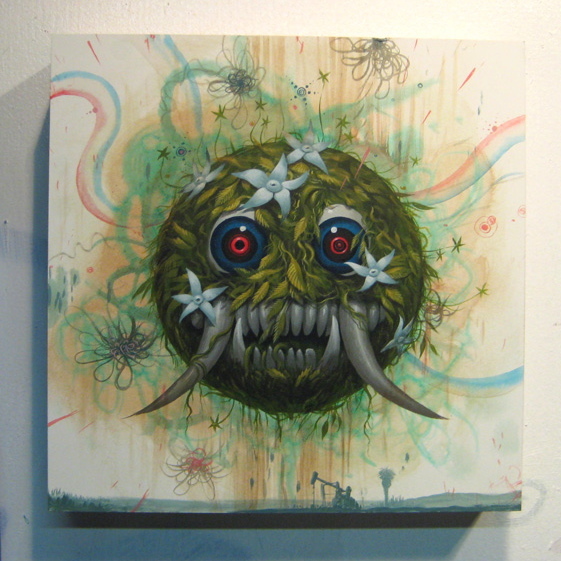 Tags: Contemporary Art, Jeff Soto, Low Brow & Pop Surrealism, Shows & Events, Soto - StolenSpace - 09.